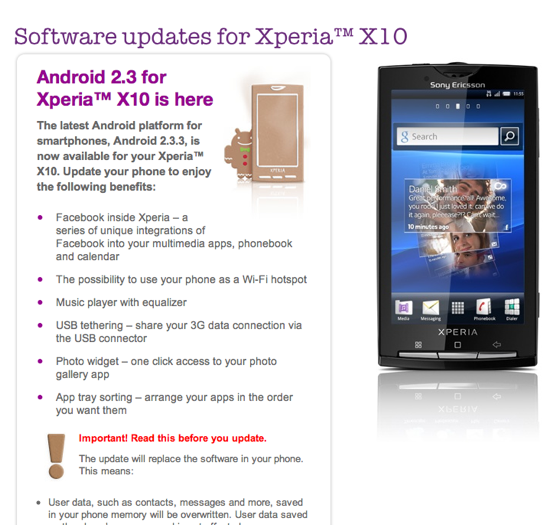 Sony Ericsson has posted Android 2.3 Gingerbread for last year's Xperia X10 smartphone. The phone maker promised the much sought after upgrade back in March, saying the software would arrive "late Q2/early Q3". Later, it revised that timeframe to early August. But we're still in late July, and here's Gingerbread. According to SE, the new OS bring to the X10: "Facebook inside Xperia, a series of unique integrations of Facebook into your multimedia apps, phonebook and calendar; the possibility to use your phone as a Wi-Fi hotspot; USB tethering, share your 3G data connection via the USB connector; Photo widget, one click access to your photo gallery app; and App tray sorting: arrange your apps in the order you want them."